Tomorrow we're going on holiday - YAY! First hols abroad as a family for a couple of years. This year we're off to Soller (Majorca)with my father in law, sister and brother in law and my 2 nephews. It's the first time we've holidayed with others before and I'm nervous! 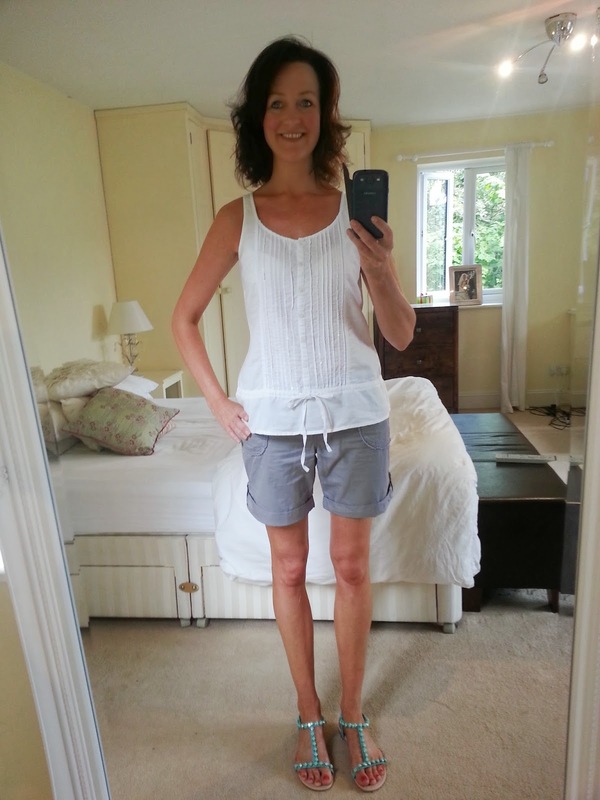 I have had to swap my usual wonder bra bikini for a more 'suitable for the older family members' tankini. I did try on lots of costumes via M&S last week but I don't want a costume, I want a tankini. All of the costumes and 2 tankinis I tried from M&S didn't work out. I have a long body and they were all too small/tight for me - even though I loved the look of the halterneck black one. TM Lewin have been on my radar for a long time. My husband buys all his shirts from them and has done for years. If I worked in an office then I too would buy from them too. When they got in touch to ask me if I wanted to style a white shirt for them I thought it would be good to see how you can wear one without looking office bound. I chose the Fitted White Piqué Shirt £29.95. 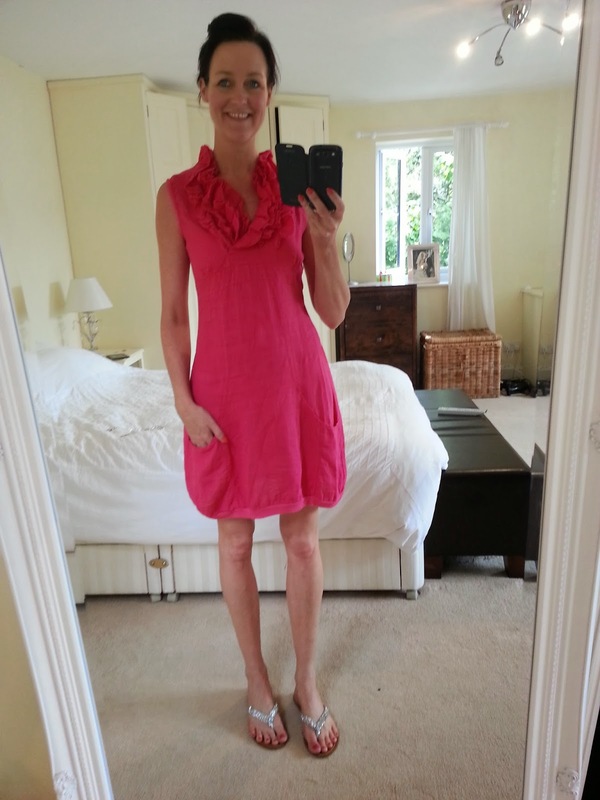 It was packed and wrapped beautifully and when I tried it on it was like pure silk (it's not, it's 100% cotton). Soft and very easy to slip on. 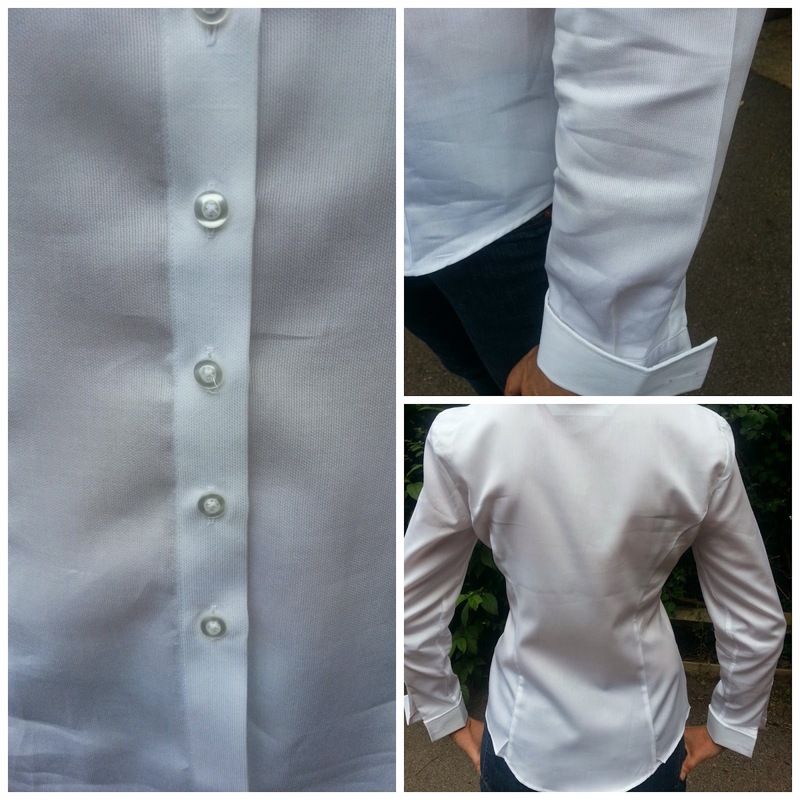 Here's how I styled the white shirt I received. See how versatile it is when you put your mind to it? I could have done more with skirts and next time I will. This shirt is my new love to be worn many times again. 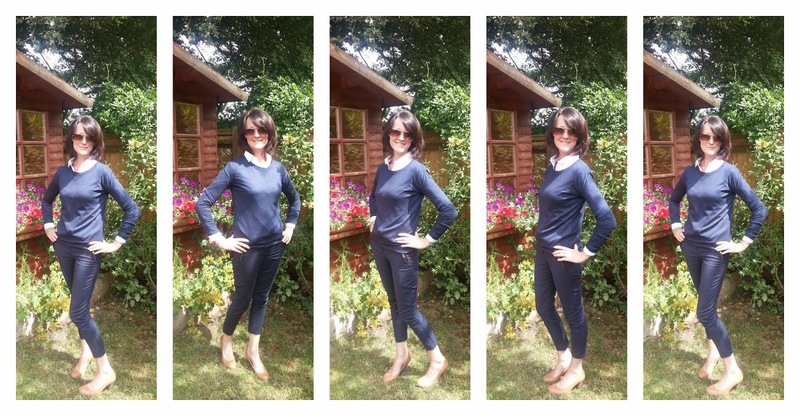 Check out how Avril from School Gate Style has worn hers - different shirt but still top quality and so easy to dress down. 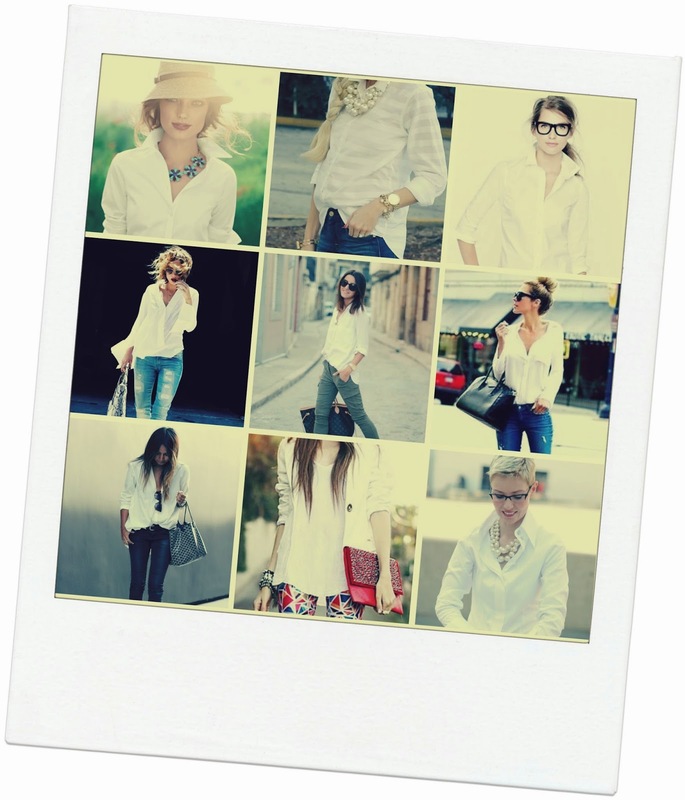 Do you wear white shirts? 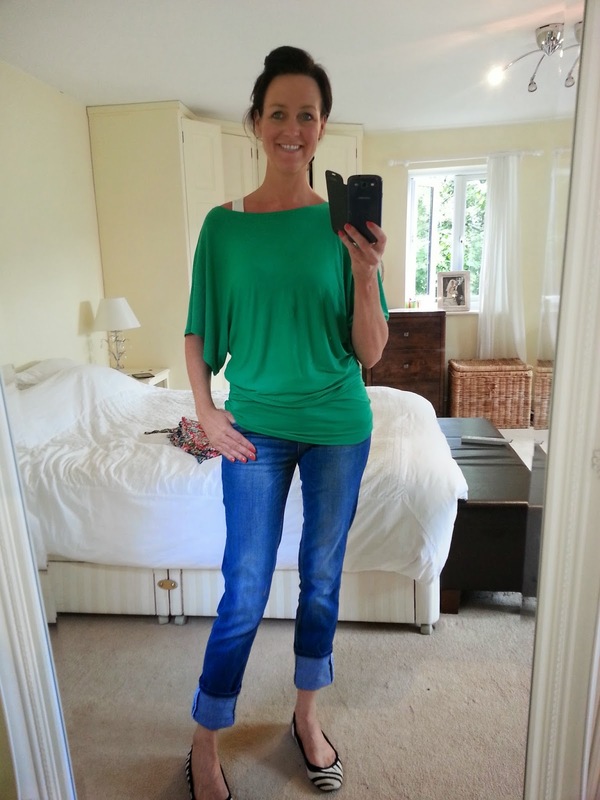 I have always stayed clear due to 'stuffy' look and feel but this shirt was so soft and easy to wear. 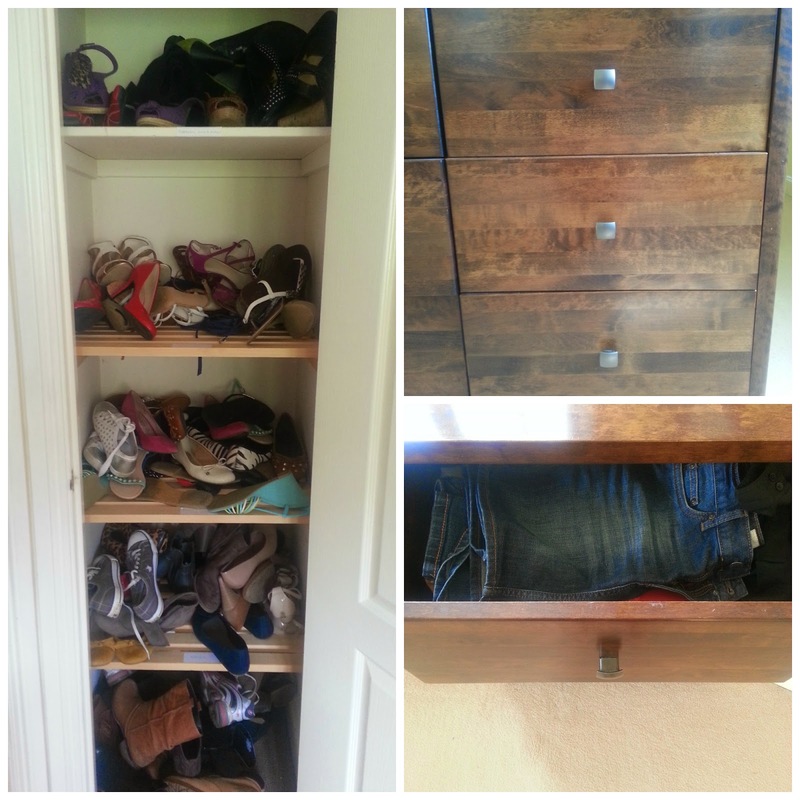 A lot of people ask me if I have a lot of clothes and where on earth do I store them all! 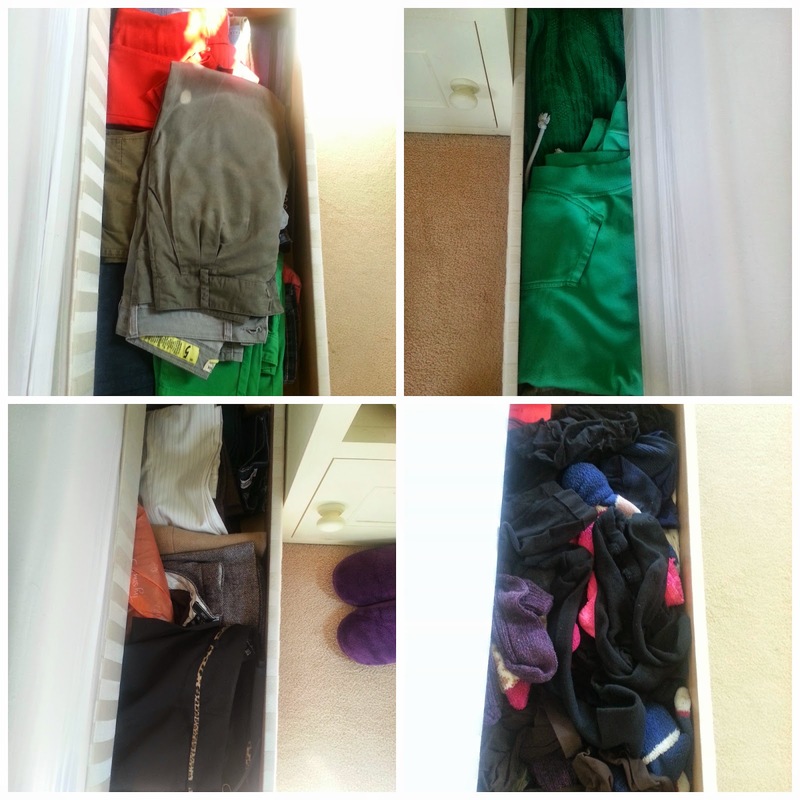 So here is a very simple post showing you where my clothes are hiding. Pic of wardrobes. If you look at the first image you will see horrible shirts of husband, so technically I only occupy a QUARTER of this wardrobe! I don't think that's THAT much do you? The great thing is it remembers the kind of things you've said you like or dislike previously. 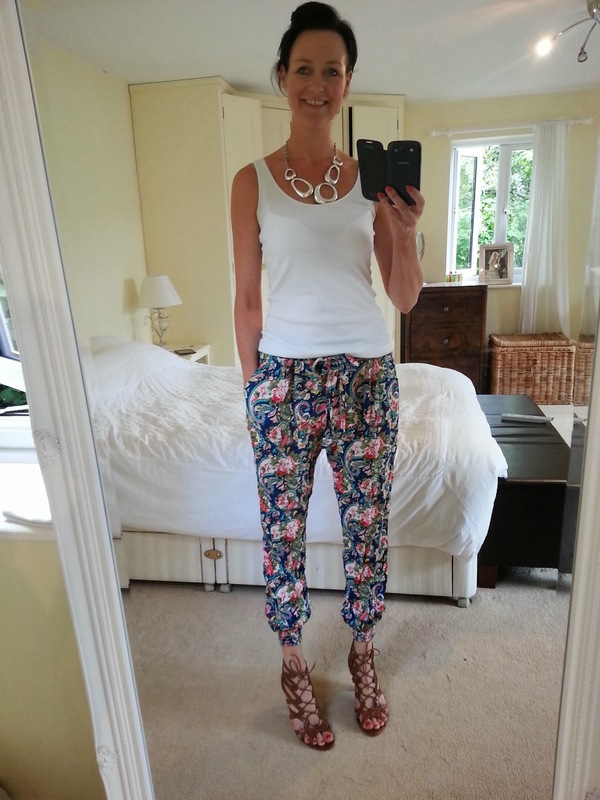 Each week I get an email from my style adviser to let me know of new items, new outfit ideas they have put together and it's really a very good service. 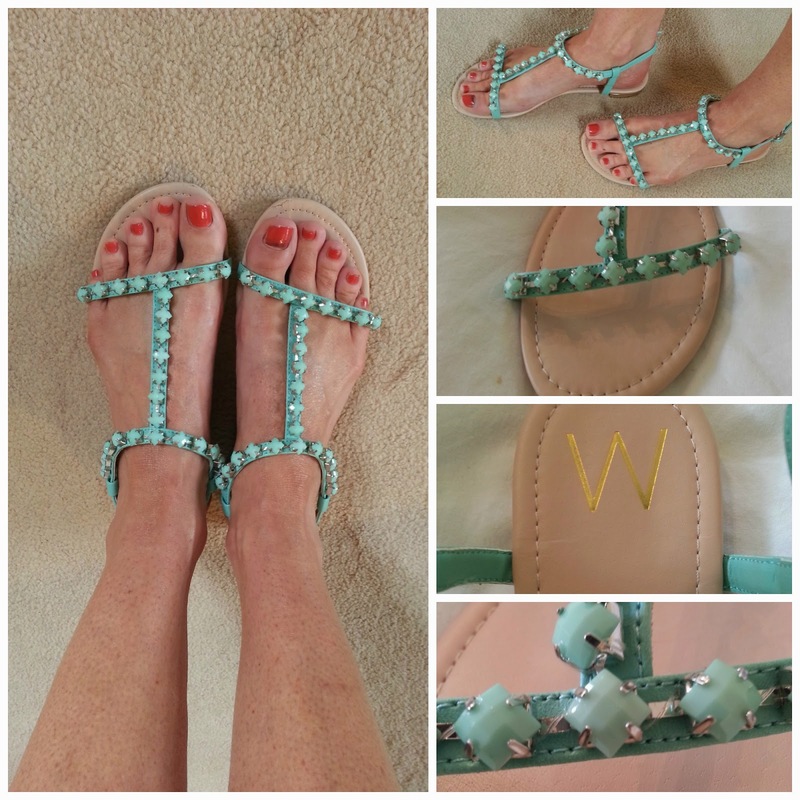 I was able to chose an item (gifted by Wallis) to try their service out and I thought sandals are a really good one to show and tell versatility. I chose the turquoise ones because they were so pretty. I have worn them lots of times already in the past 10 days. The great news is, these sandals are now in the sale at just £22.40! 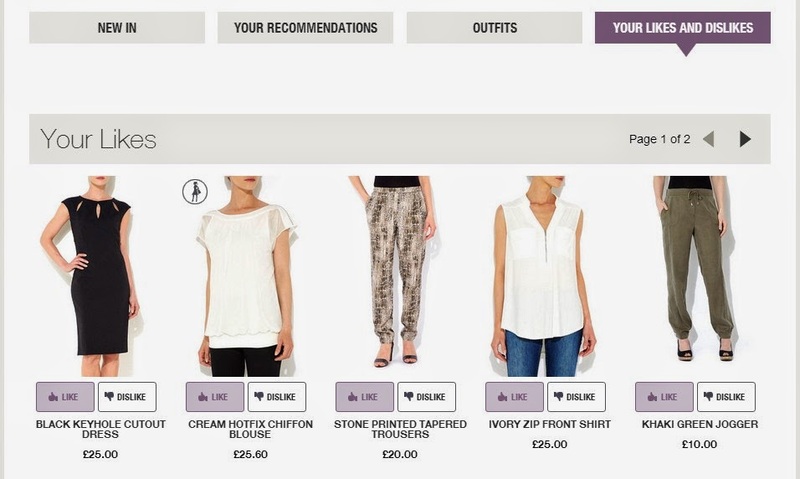 Have you tried the Wallis Style Adviser service out? If you are unsure of what to wear, how to wear it or what might suit you then I cannot encourage you enough to try it out. I'm having a really busy time of late so blog posts are sporadic to say the least! I'm working 4 days a week now and play days are only Friday-Sun which is good as I have that FRIDAY feeling on a Thursday! Have been busy buying stock for the shop and some bits have already sold out which is great! Oh and the trainers went back, they were not fit for purpose (fashion not running) and now my spending ban is continuing way beyond the 9 month target I set myself. The reason being I have 3 breaks to save for next year (friends 40th in Portugal, friends 40th in Barcelona and I want to take Mr Blake and I away for a city break too). So it's all save save save for me. I still have EVERYTHING I need, I don't think there is one single item of clothing or footwear I REALLY need. Here I am making what I own already work for me! I've also semi ditched Twitter in favour of Instagram. This platform makes so much more sense as it's all about the visual and to be honest, Twitter confused me! When I first eye spied Victoria cannot look bad in my eyes ever Beckham in her culottes the other month I swooned. She looked amazing. My impression of the culotte is that it was put into the history books never to be brought out again. The rule of 'wore them the first time' is ever present in my mind with fashion right now. 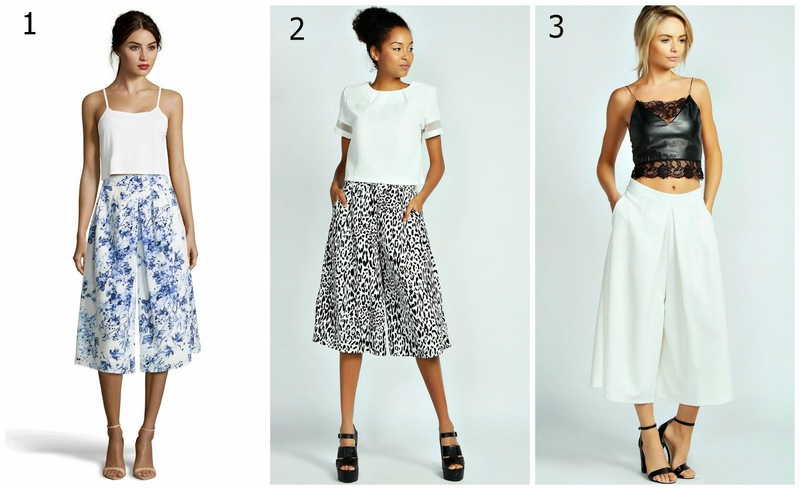 Let me bring to you where to buy the culotte on the high street/online today. 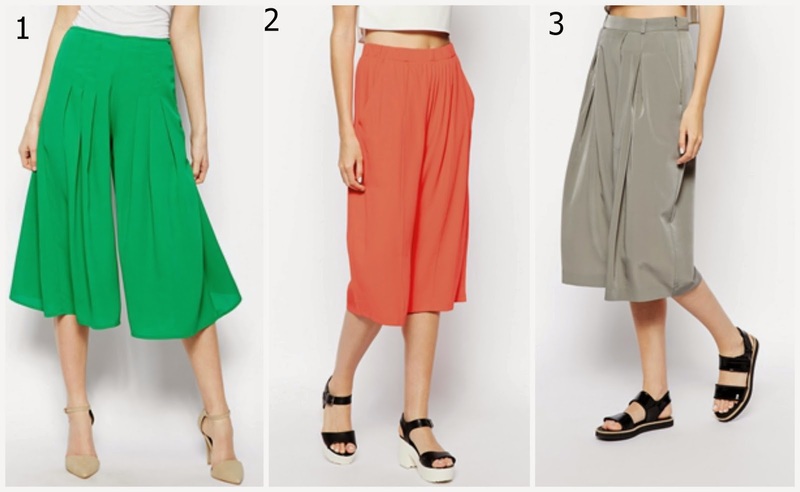 Looks like culottes (in my opinion) look best with a small heel instead of flat birk style sandals and the top part can be anything. Dress us as Frances has on the left image above or dress down with a jumper as per the Gucci image from Pinterest. 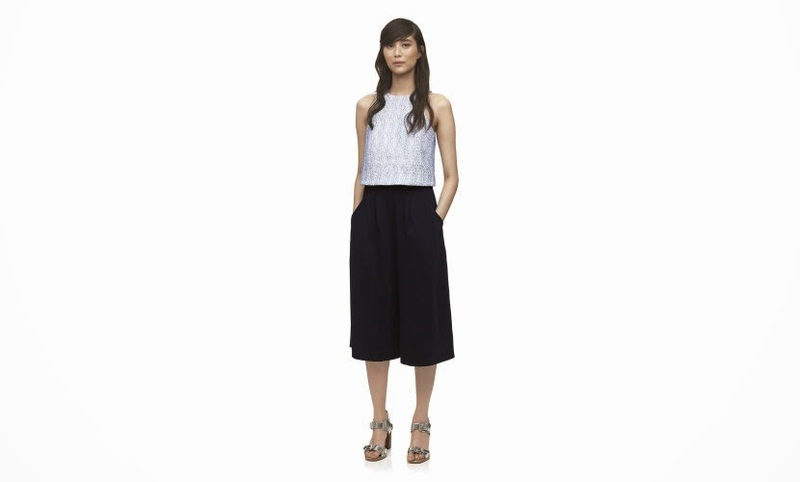 For a classic navy pair try Whistles navy culottes - £125 (too pricey for me)! Oh and here I was this morning running around like a blue arsed fly dithering about what to wear. Legs are patchy from crap false tan and hairy because I am a lazy cow. 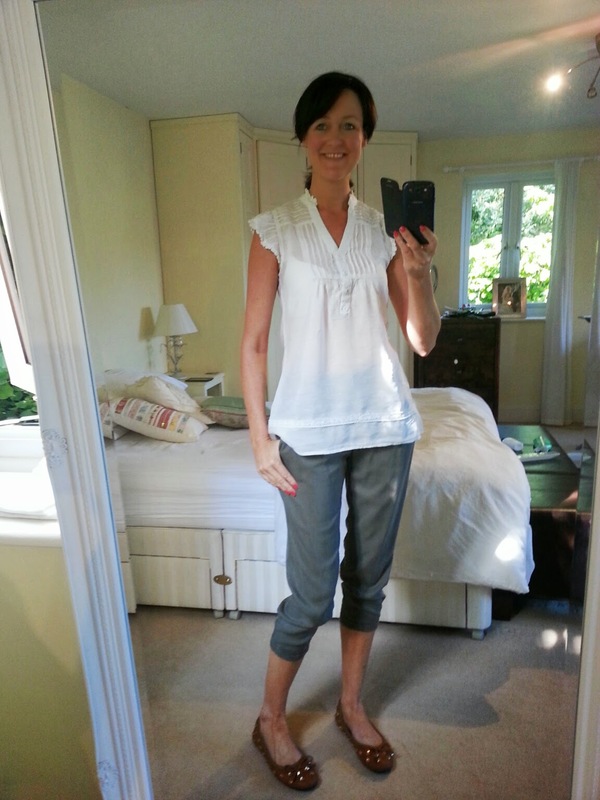 I put the outfit on and felt so mumsy so I simply added a belt and tucked the top in - makes all the difference don't you think? 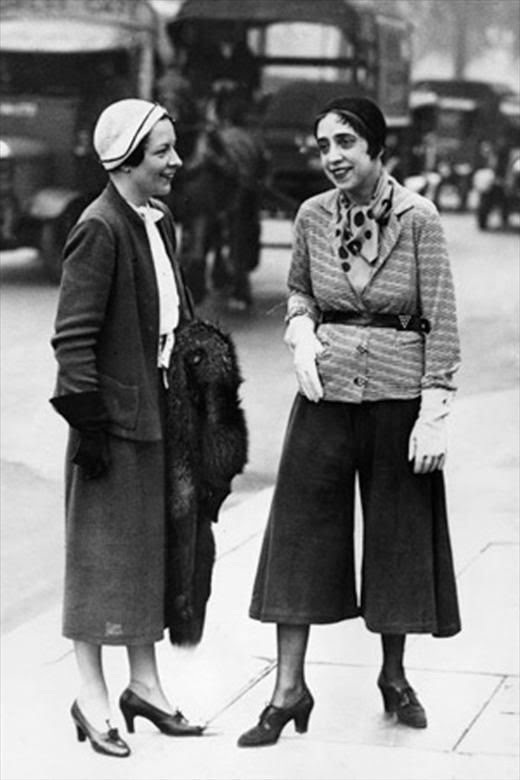 Culottes are certainly a 'trend' I'm thinking about and by the time I make my decision they will be well and truly old fashioned, I am like that you see! Did I break the spending ban? 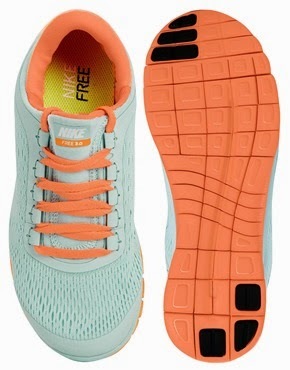 I have been lusting after a pair of trainers for a long time. I nearly jumped on the New Balance band wagon 6 months ago but as I was within my spending ban period I tightly held on and let the storm pass. I very nearly went down the Original Adidas Stan Smith route too - so very very very nearly swayed by the gorgeous Francis from School Run Style .. again I held on tight and the urge went. I couldn't let these one go by without buying. I've eyed them up for around 6 months but at £90 there was NO WAY ON EARTH I'd spend that on a trainer that would be used ONLY for fashion and not sport. I know they are a sport trainer but I am not a sporty person. So down to the question of have I broken the spending ban? My original theory was that *I* personally would not spend *MY* money on anything. The Tesco tshirt (£4) I bought when I was out food shopping. The recent Tesco haul was bought with money from my Dad. These trainers were bought by Avenue 57 business for a cough cough blogging photoshoot I'm doing soon. So do you see that *I* *PERSONALLY*, really if you bend it, twist and don't look too closely at the detail, didn't buy them! You've got to love my logic right? I cannot wait for them to arrive. I've already thought of a few outfits to wear them with! 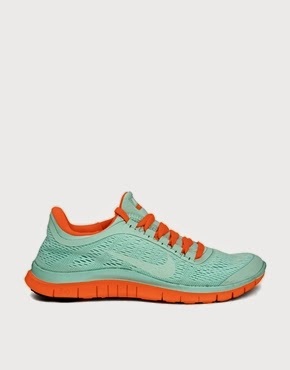 WAHOO COME TO ME, come to me now you pretty little things. If they don't fit or suit then I actually will cry! I adore Hush but my wallet does not. I know the clothes are amazing, they're not only very well made and are set to last a long time but they offer wardrobe staples and on trend items. I've written about them before and I lust after them all the time. It's time to put my spending ban to good test as I pick out the very good sale items I really would like. Apart from the items I have chosen here (and a couple more online), there really is no sense of AMAZING SALE, more of a 'that's a good discount. I also wanted the star jumper and harem pants to be on sale, sadly not. 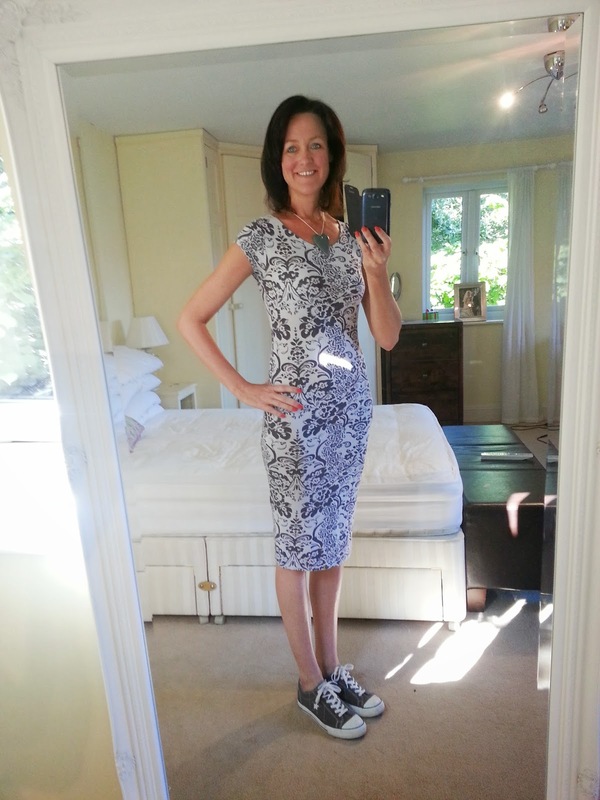 What to wear when you're 40? I think that since I turned 40 (last September) I have finally become very happy with myself. I couldn't wait to turn 40 and I have not been disappointed at all by the year I've had. 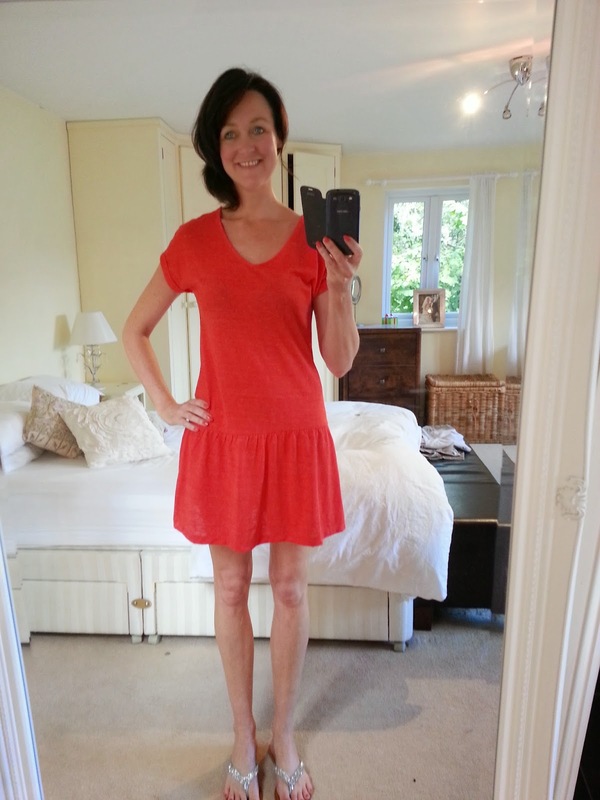 In terms of fashion/style I am very comfortable and have finally learnt what looks good, how to dress for my shape and how to make my wardrobe work for me without buying lots of new things. I am currently on month 6 of not buying anything (ignore the tshirt, the 2 tops, the jumper and the 2 pairs of shorts I bought recently in Tesco (total spend £50). 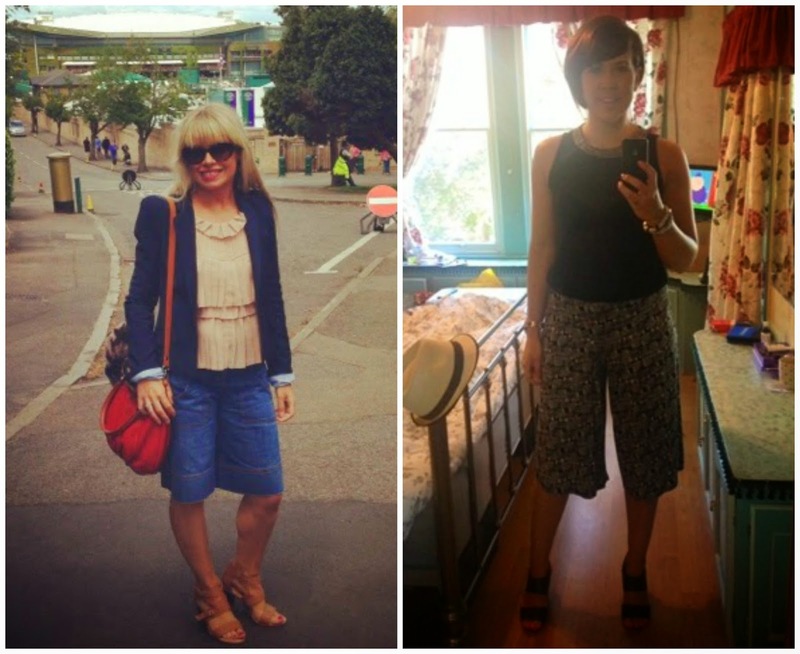 Here are some of my favourite outfits from the past month. Since I started working in an office with other women I've made more of an effort in what I wear. The other office I work in is full of developers ... 'nuff said. 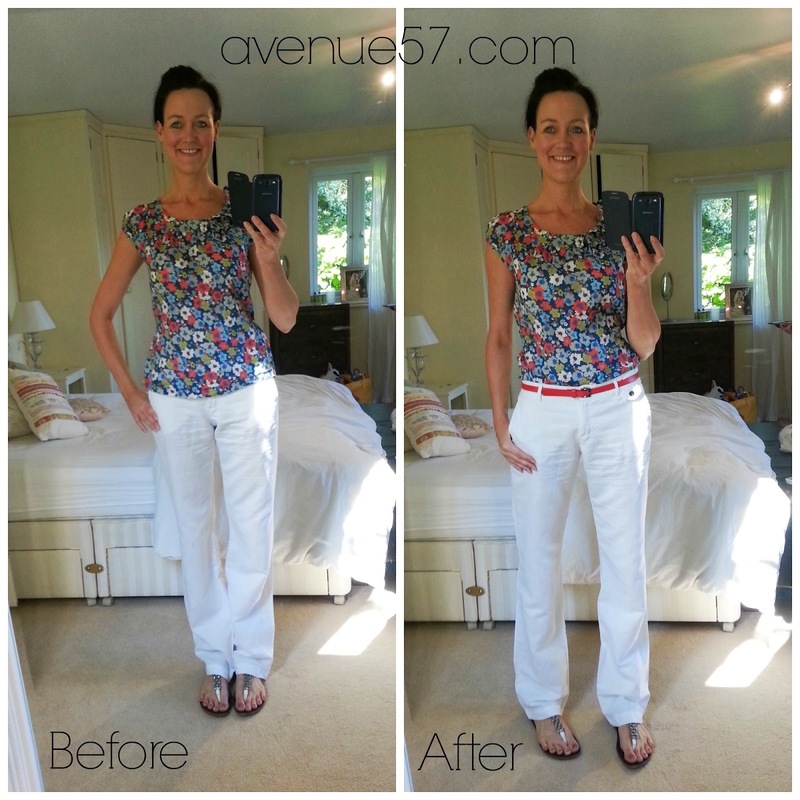 I never get bored of sharing my outfit on Avenue 57. 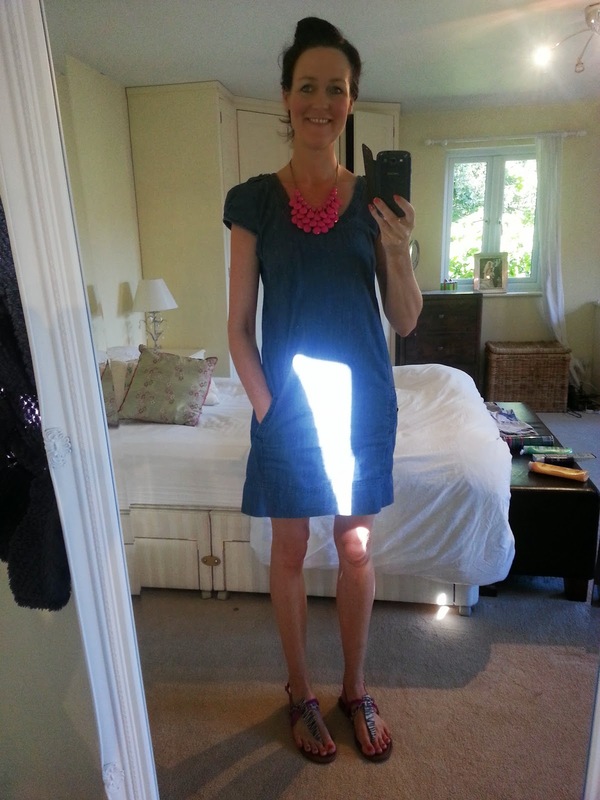 I set it up because I didn't know what was right or wrong to wear as I headed towards 40. It's like a daily Pinterest for inspiration and outfit ideas.